Merial has recently introduced PUREVAX® Feline Rabies 3 YR, the first nonadjuvanted feline rabies vaccine with a three-year duration of immunity. Until now, Purevax has been labeled for just one year. Rabies vaccinations are the most common cause of vaccination site sarcomas and vaccinosis. Vaccination site sarcomas are almost always fatal, even after surgery and chemo and other cancer treatments. Purevax is believed to be safer than other rabies vaccines because it contains none of the adjuvants or substances added to vaccines to alert the immune system that an antigen is present. Adjuvants are believed to be the cause of those deadly vaccination site tumors. 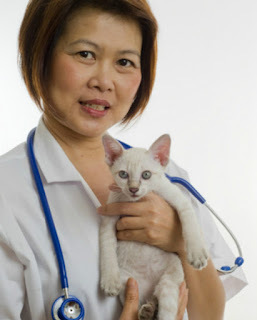 While Purevax may be safer than other rabies vaccines, think carefully and do some research before you take your cat in for those "annual shots." No medication is completely risk-free and studies show cat vaccinations provide immunity for a lot longer than many veterinarians would have us believe. These videos are a great place to start your research. They're long but worth watching.